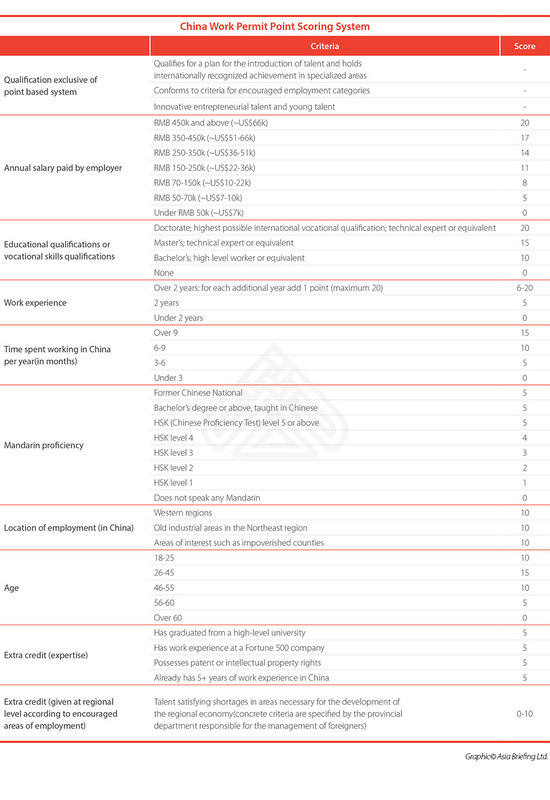 China Work Permits: Are You an A, B, or C Tier Talent? The changes to the system result in a more streamlined process, doing away with inconsistent regional administration, and allows for employers to submit applications online. Furthermore, the change has removed any confusion foreigners may have had as to which permit to apply for. The new system has also introduced a three-tier talent grading system for expatriates, the benefits of which are less clear. While A-grade expats enjoy some additional advantages, those falling in Tier B and Tier C may face tougher entry requirements, lower permit validity, and longer waiting times than before. This article clarifies who is placed where under the new system, and the implications of the classifications. Expats are placed in either Tier A, B, or C by earning the associated amount of points under the point scoring system, or by fulfilling a condition that automatically places them in a given tier. The new work permit system introduces a point scoring system to judge candidates’ qualifications. Applicants scoring 85 or more points qualify for Tier A; those scoring 60-85 class as Tier B; and those scoring below 60 fall under Tier C.
In addition to the point scoring system, applicants can be placed in a given tier if they meet certain specific conditions. o Has held a senior position in government, in an NGO, or in a renowned international organization, e.g. ASEAN, the World Bank etc. • Are under 40 years of age doing post-doctoral research, and have graduated from a high ranking university or academic institution. o A management, technical, educational, or research position possessing skills particular to: education, science and technology, news, publishing, culture, the arts, hygiene, sports, etc. • Persons earning over four times the average local salary. • Positions subject to quotas, such as young talent coming to China for internships. Tier A comprises approximately 16 percent of expats in China. Individuals in this category enjoy several benefits not enjoyed by Tier B and Tier C workers, including a “green channel” service. This allows for expedited approval, resulting in processing times shortened by around five working days. Tier A expats also benefit from paperless verification during the application process. Moreover, they are not subject to requirements of age, education degree, or work experience. In general, individuals qualifying for Tier A enjoy a more inclusive and convenient environment, both before and after the application process. Around 61 percent of expats fall into the Tier B. A bachelor’s degree and two years of work experience in a relevant field should be enough to qualify for Tier B status in most cases, so long as the position is reasonably elevated or technical. However, application procedures are strict and time consuming in comparison to Tier A. Those falling under Tier B must provide all relevant documents in original paper form. Additionally, Tier B expats are controlled according to labor market demand. They may find it more difficult to obtain a work permit in saturated industries compared to their Tier A counterparts. Work permits may also be issued with shorter validity periods than for individuals falling into Tier A. It is still unclear how strict such controls will be. Whether significant changes will apply should become evident within the year. 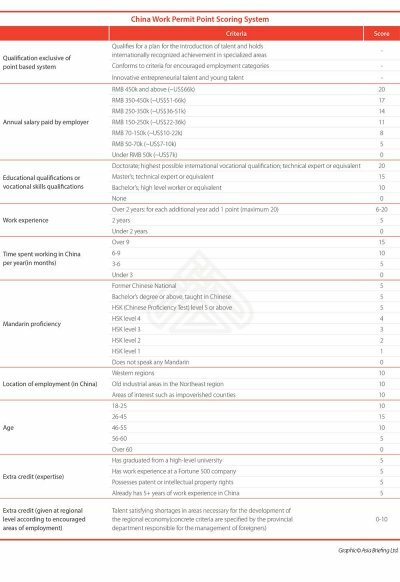 Tier C (approximately 22 percent of expats) is meant for individuals not planning to work in China for extended periods of time, such as company representatives placed abroad for a few months. It also accommodates individuals entering the country under Chinese government young talent initiatives (currently only the China-France 1,000 interns program exists). Tier C applicants can expect permit availability subject to the needs of the labor market and are subject to government quotas, longer processing times, and short validity periods. Most individuals already employed in China with a work permit have no reason to worry. Most of those who qualified under the old system will attain at least Tier B status once applying for a new permit. For new applicants, most mid-level to senior managers or technical staff should be clear to receive Tier B status or above. Any individual with experience and qualifications in science, technology, engineering, and mathematics (STEM) fields will also likely face no difficulty in this respect. Lack of Mandarin proficiency is of little worry, as this has a negligible effect on tier placement. Additionally, individuals hoping to work in Central or Western China, or businesses hoping to hire foreigners there, are likely to succeed, due to a governmental drive to develop those regions. Those in mid-level to senior positions in higher education are also treated favorably by the new tier system. Businesses hoping to employ fresh university graduates into entry-level positions may find themselves frustrated. Opportunities to get around the two year requirement have opened up in some cases, such as inside free trade zones. However, the average graduate with a bachelor’s degree will find it hard to work in China without first acquiring at least two years of industry experience abroad.